Are you sick of hearing tech pundits trumpeting that the democratic successes of Arab Spring can be attributed in large part to Twitter, Facebook, and other social media? Maybe you're a little suspicious of the idea that social media is freedom's greatest ally, especially given that Facebook is being used increasingly for workplace surveillance. If your skeptic's spidey sense tingles when you hear about how Twitter will set us free, then you need to check out a great book on this topic, Evgeny Morozov's The Net Delusion: The Dark Side of Internet Freedom. It's just come out in paperback with a new afterword, which I've excerpted below. The Arab Spring proved undeniably that the authoritarian quest to tame the Internet is abetted by Western consulting and Western technology; there are few countries in the Middle East and North Africa where Western ﬁrms have not supplied either surveillance or censorship technology or both. American diplomats, in the meantime, continue to look the other way: In late 2010 the State Department gave Cisco-a company that made the Great Firewall of China possible-an award in recognition of its "corporate excellence." In the meantime, the likes of Google and Facebook continue reshaping the Internet in accordance with their own corporate visions, making it more transparent, efficient, connected-but also less anonymous and thus far less suitable for dissent. Facebook's forays into facial recognition, recent revelations that it had been tracking users even when they were logged off, and Google's initial refusal to tolerate the use of pseudonyms on its recently launched social network Google+ all suggest that the Internet culture itself is becoming more and more hostile to certain kinds of online activism, even when both Facebook and Google are celebrated for their role in democratic revolutions. . . .
Let's not allow cyber-utopianism to prevent us from getting all the facts straight. The Arab Spring is not just about brave activists toppling ruthless dictators. It is also about the complicity of Western ﬁrms selling surveillance and censorship technology to themost heinous regimes in the world. It is about the ability of authoritarian governments to completely turn off the Internet with a kill switch. It is about the despicable and unnecessary legalistic policies of sites like Facebook that insisted that no Egyptian or Tunisian dissidentscould use their services unless they set up accounts using their realnames rather than pseudonyms. It is about the embarrassing stance of Western politicians who showed that concerns about Internet freedom would always take second seat to broader concerns about "stability" - even if delivered by dictators - in a traditionally volatile region. What better example is there than Egypt, where Washington has spent far more money training Mubarak's police force than anti-Mubarak bloggers? The point of such criticism is not to make it impossible for Western politicians to train bloggers. The point is to make it impossible for them to use such training to celebrate the success of "democracy promotion" and divert our attention from their support of heinous Western-friendly dictators, many of whom still prosper even after the Arab Spring. Sure, some might counter that none of this matters, for the activists have won in the end. I don't think that's a reasonable position to take - and certainly not for those who are concerned with the future of democracy. Even the wildest cyber-utopians would agree that it was not the use of particular digital tools that ensured the timely departure of Egypt's and Tunisia's rulers; rather, it was the conﬂuence of favorable political, social, and cultural factors, with technology playing an important mobilization role - but only because the environment was already enabling. It's not so hard to imagine how, if the political situation on the ground was different, the Egyptian and Tunisian dictators couldhave stayed in power - despite all the Facebook and Twitter activism - by shedding more activist blood, as was the case in Iran in 2009. The failure of the Green Revolution in Iran was not due to the revolution-aries' low use of Twitter-they had plenty of people on the streets without it - but the result of smart maneuvering by Ahmadinejad's regime. To proclaim that Egypt and Tunisia show that democracy - powered by Facebook - always wins, regardless of surveillance, propaganda, orcensorship apparatus of the dictators, is not only false but also irresponsible, at least as far as the crafting of future policies is concerned. The abuses of technology are always worth worrying about regardless of happy endings we may observe in particular cases, for such happy endings are, by and large, determined by factors that are independent of technology.
. . . My suspicion of Twitter and Facebook as vehicles of political change is not rooted in some Luddite skepticism about their ability to mobilize people, as many critics have assumed . . . In fact, throughout the book, I explicitly celebrate both Facebook and Twitter for their ability to mobilize people . . . While I can easily acknowledge that Facebook and Twitter can do wonders for raising money or spreading information, I still believe that our modern political life is not exhausted just by these two activities and that there are other goals, needs, and values that need to be advanced. 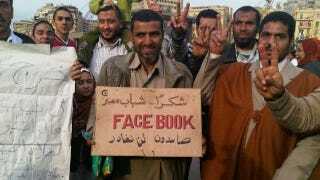 To put it insimpler terms: To fully assess the impact of Egyptian Facebook activists on democracy in their country, we can't just marvel at the seeming success of anti-Mubarak protests. We also need to understand whether the new decentralized structures that eventually emerge out of such technopolitics will be capable of countering the pro-Mubarak or extremist elements after Mubarak's ouster, when politics moves from the streets to the polling booths. Read the rest of the afterword here, or better yet, just buy the book.